Researchers from the National Institute of Standards and Technology (NIST) developed a new microscope, called a heterodyne magneto-optic microwave microscope (H-MOMM) that can measure the collective dynamics of elecrons spins. The microscope can measure the spin in individual magnets as small as 100 nanometers in diameter. The NIST researchers used the H-MOMM to quantify, for the first time, the spin relaxation process—or damping—in individual nanomagnets. The results suggest that designing spintronic devices to have uniform spin waves could dramatically reduce the energy required to write a bit. They say that these results are "groundbreaking". Researchers from the National Institute of Standards and Technology (NIST) and University of Colorado Boulder (CU) developed a new chip that uses microfluidics and magnetic switches to trap and transport magnetic beads. This low-power device may be useful for medical devices. This technology may also lead us towards "MRAM" chips used for molecular and cellular manipulation. In the past, magnetic particle transport chips required continuous power and even cooling. This new technology manages to overcome the power and heat issues, and offers random-access two-dimensional control and non-volatile memory. The prototype chip uses 12 spin valves (commonly used as magnetic sensors in HD read heads) which are optimized for magnetic trapping. Pulses of electric current are used to switch individual spin valve magnets “on” to trap a bead, or “off” to release it, and thereby move the bead down a ladder formed by the two lines. The beads start out suspended in salt water above the valves before being trapped in the array. Paul Haney and Mark Stiles from the NIST Center for Nanoscale Science and Technology (CNST) developed a new theory of current-induced torques that generalizes the relationship between spin transfer torques, total angular momentum current, and mechanical torques. This new theory is also applicable to more materials than previous theories. The basic idea is that there are two types of current-induced torques: a mechanical torque acting on the lattice, and a spin transfer torque (STT) acting on the magnetization. STT is a known phenomenon that is the basic of several technologies such as STT-MRAM and nanoscale microwave oscillators. 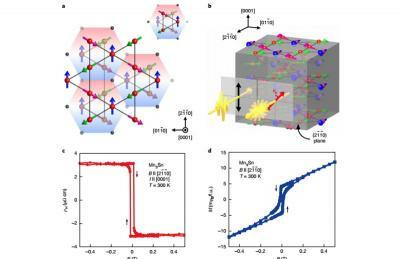 Researchers working at the National Institute of Standards and Technology (NIST) have demonstrated for the first time the existence of a key magnetic—as opposed to electronic—property of specially built semiconductor devices. This discovery raises hopes for even smaller and faster gadgets that could result from magnetic data storage in a semiconductor material, which could then quickly process the data through built-in logic circuits controlled by electric fields. In a new paper, researchers from NIST, Korea University and the University of Notre Dame have confirmed theorists’ hopes that thin magnetic layers of semiconductor material could exhibit a prized property known as antiferromagnetic coupling—in which one layer spontaneously aligns its magnetic pole in the opposite direction as the next magnetic layer. The discovery of antiferromagnetic coupling in metals was the basis of the 2007 Nobel Prize in Physics, but it is only recently that it has become conceivable for semiconductor materials. Semiconductors with magnetic properties would not only be able to process data, but also store it. Researchers at the National Institute of Standards and Technology have made the first confirmed “spintronic” device incorporating organic molecules, a potentially superior approach for innovative electronics that rely on the spin, and associated magnetic orientation, of electrons. The physicists created a nanoscale test structure to obtain clear evidence of the presence and action of specific molecules and magnetic switching behavior. Spintronic devices usually are made of inorganic materials. The use of organic molecules may be preferable, because electron spins can be preserved for longer time periods and distances, and because these molecules can be easily manipulated and self-assembled. However, until now, there has been no experimental confirmation of the presence of molecules in a spintronic structure. The new NIST results are expected to assist in the development of practical molecular spintronic devices.